Since I’ve taken up bicycle riding again I find myself going down streets I never would have gone down in the car, and finding old treasures at the curb which I never would have seen. Like this 1978 AMC Concord DL wagon. AMC’s compact Hornet morphed into the Concord for MY 1978 as it tried to move upscale. Which it did, but it wasn’t enough to save AMC from eventually going out of business. 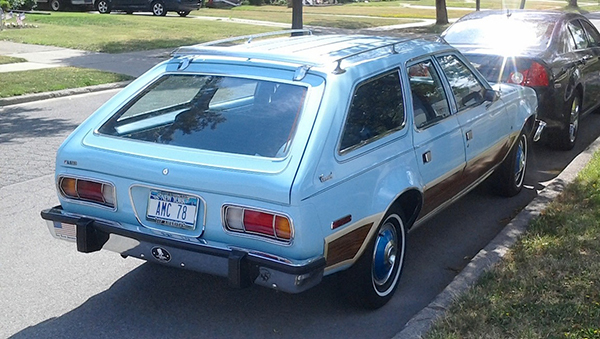 Saw this beautiful blue wagon (called Sportabout when they were still Hornets) in Kenmore over the weekend.